Endeavour shuttle Andrew Feustel (top) and Mike Fincke conduct the second spacewalk of their STS-134 mission at the International Space Station on May 22, 2011 (Flight Day 7). Two spacewalking astronauts ventured outside the International Space Station Sunday (May 22) on the second spacewalk of their mission, this one aimed at greasing up a huge gear and refilling a vital cooling system with ammonia coolant. "Alright guys, here we go," said Endeavour astronaut Greg Chamitoff, who choreographed the spacewalk from inside the shuttle. "This is an important one for the longevity of the station, for the power and cooling, so let's get started." An ammonia pump failure in late July 2010 knocked out half of the space station's cooling system and forced the astronauts onboard to shut off many non-critical experiments and systems in order to prevent the station from overheating. 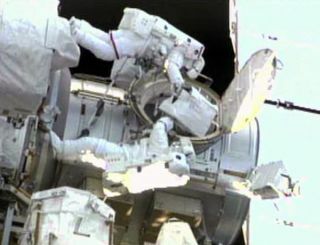 NASA astronauts Douglas Wheelock and Tracy Caldwell-Dyson performed three emergency spacewalks to replace the broken pump with a spare. Later, engineers detected a slow leak in the system. After ground controllers perform leak checks on coolant hoses, Feustel and Fincke will begin refilling the cooling loop radiators. This procedure should take approximately 10 minutes, during which time five pounds of ammonia will be topped off into the loop. Once the loop is refilled, Feustel will vent any residual ammonia from the hoses used in the task before they are removed. Meanwhile, Fincke will begin work to lubricate one of the station's massive Solar Alpha Rotary Joints on the port side. Today's spacewalk marks the second time astronauts have greased up one of the space station's huge solar array gear on its main truss. On today's outing, Feustel and Fincke will refresh the lubrication on the port side rotary joint, which is covered by 22 protective panels. For one of the panels, Fincke will inspect the area underneath, take photos and wipe the surface of the joint to collect samples of the remaining grease from the previous lubrication. Fincke will then use grease guns to apply more lubricant to the surfaces of the joint. Once he is finished greasing underneath the first set of covers, he will travel back to Feustel's work area at the cooling loop to return the system back to its normal configuration. Once this is complete, flight controllers at NASA's Johnson Space Center in Houston will rotate the joint by 200 degrees to spread the grease. This rotating maneuver will take about an hour, during which time Fincke will install two beams on the station's truss that will be used to store handles that would be necessary if a radiator should ever need to be replaced. Feustel will then begin work on the Special Purpose Dexterous Manipulator, or Dextre, which is a two-armed maintenance robot at the end of the station's robotic arm. Feustel will install a cover on one of the robot's cameras and will lubricate the snares that allow the robot to grab onto equipment. At the end of these tasks, the port side Solar Alpha Rotary Joint should be ready for a second round of greasing. Feustel and Fincke will work together on this before reinstalling the covers over the joint and making their way back to the station's Quest airlock to end the spacewalk. "Welcome to your first US-based EVA from the US airlock. How's the view from the other side?" Chamitoff told Fincke, whose prior six spacewalks were in Russian spacesuits out of Russian space station airlocks. After today's outing, there are two remaining spacewalks during Endeavour's STS-134 mission. Feustel and Chamitoff performed the mission's first spacewalk on Friday (May 20). The planned 6 1/2-hour excursion was short when a spacesuit sensor that detects carbon dioxide levels failed on Chamitoff's suit. The spacewalkers spent a total of 5 hours outside the station and completed majority of the planned tasks. A 45-minute task that was left unfinished at the end of the first spacewalk will likely be added to the mission's third outing on Wednesday (May 25), NASA officials said. The four spacewalks of this flight will be the last spacewalks ever carried out by a space shuttle crew. NASA's final shuttle mission – the STS-135 flight of Atlantis in July – has no spacewalks scheduled.